Cochlear implants (CI) are surgically implanted medical devices that bypass nonfunctioning auditory (hearing) nerve endings in the inner ear to activate the auditory nerve to enable the recipient to hear. Adults and children who cannot receive sufficient benefit from hearing aids are candidates for cochlear implants. At present, the cochlear implant is the only FDA approved surgically implantable bionic prosthesis available for restoration of a sensory function. The modern cochlear implant has two parts: an external non-surgically implanted speech processor and an internal surgically implanted unit. The external speech processor, worn behind the ear, has a microphone to pick up sounds which are then converted into encoded signals that are transmitted by radio waves to the internal surgically implanted part. The internal receiver unit then sends this coded information via an electrode array to stimulate the auditory nerve fibers in the inner ear (cochlea). The activated auditory nerves transmit the sound signal to the brain for sound perception. The perceived sound signals may not be identical to sounds heard by the normal hearing ear, but profoundly hearing impaired people learn to interpret this range of auditory signals to understand speech. At this time, cochlear implants do not restore normal hearing, but produce meaningful auditory perception for speech comprehension for most CI users. The speech comprehension with the cochlear implant varies depending on such variables as the length of the deafness, age, auditory skills before the onset of hearing loss, brain adaptation (plasticity), and cause of deafness. Over 50% of recently deafened adults following normal hearing are able to understand speech over the telephone. Nevertheless, the hearing results are quite variable with some performers functioning at low, medium, and high “superstar” performances. Most of the improvement for cochlear implants occurs over the first 24 months. During this initial postoperative period, time is required for practice and retraining the brain to interpret the new sound’s signals. After implantation, the processor is adjusted (mapped) over several sessions over the first year, as the brain is able to handle more auditory information. 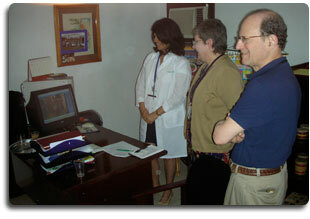 The first mapping session usually occurs about three weeks following cochlear implant surgical implantation. Ultimately, an optimal auditory map is created for a given period of time, and can be further modified on a six to twelve months basis as needed. Mapping is done at the Cochlear Implant Center. The earliest implant with electrical stimulation of the inner ear was performed by Djourno and Eyries in Paris in 1957. The patient was able to hear sounds but was not able to understand speech with this stimulation. In the 1960s, William House, MD, in Los Angeles, implanted single channel implants which enhanced lip reading and speech production, but there was no meaningful speech understanding by the cochlear implant recipients. Speech understanding began to occur with the multichannel cochlear implants in 1984. The FDA approved multichannel implantation for adults in 1985 and for children in 1990. Significant improvement in speech understanding with more sophisticated software program and strategies commenced in 1991. “At present, there are three FDA approved cochlear implants available in the United States: Cochlear Americas from Australia, Advanced Bionics from the United States, and Med-El from Austria. These cochlear implants have similar speech perception performance outcomes but have some user features that distinguish them from each other. You will become acquainted with each of these products at the Cochlear Implant Center. Currently, 100,000 people have been implanted worldwide in whom 22,000 adults and 15,000 children have been implanted in the United States. Dr. Hammerschlag has been involved in the cochlear implants since 1985 when he participated in the first multichannel cochlear implantations at NYU. Although the majority of cochlear implants have been implanted in one ear, recent investigations have demonstrated improved hearing with bilateral cochlear implants. The improvement is less than seen with cochlear implantation in one ear following deafness. Bilaterally implanted recipients have noticed enhanced sound localization, improved speech understanding in ambient noise, and greater sound sensitivity from further distance when compared to unilateral cochlea implantation. Bilateral cochlear implantation can be performed simultaneously at the same surgery or sequentially at different times. More information may be obtained at the Cochlear Implantation Center during or after your evaluation process. Candidates for cochlear implantation must meet certain audiometric threshold criteria to be considered for implantation. At present (2010), patients with speech understanding (Speech Discrimination Score) of less than 50 to 60% in the best hearing ear with optimal hearing aid amplification is one of the screening criteria. A more detailed audiometric candidacy evaluation to assess the likelihood of improved auditory performance with a cochlear implant compared to amplification with the hearing aid will be part of the cochlear implant evaluation at the Cochlear Implant Center. Your audiometric profile and the ability to partake in postoperative rehabilitative mapping will be reviewed You will also receive detailed counseling about cochlear implants, expectations, rehabilitation, and other information about cochlear implant devices available in this country. The cochlear implant audiometric evaluation and counseling takes several hours, usually over two or more sessions. This evaluation process also will be an opportunity to learn about cochlear implants. Your medical evaluation by your cochlear implant surgeon will include CT scan or MRI imaging of the inner ear to assess surgical candidacy. Our office will help you obtain the correct image studies. Because the CI usually has an internal magnet to affix the external component to the scalp, an MRI cannot be utilized. If necessary, the magnet can be surgically removed on a temporary or permanent basis. Please go to Cochlear Implant Post-Operative Instructions on this website for more details. You will also need to be cleared by your physician for two to three hours of general anesthesia and have no bleeding or medical problems to contraindicate surgery. It is anticipated that you or your child will be able to go home the same day of surgery. You will also require a preoperative vaccination for pneumococcal meningitis, a common cause of bacterial meningitis. This kind of meningitis is a very serious infection, which requires prompt treatment. It is also can cause deafness (in children with normal hearing). Pneumococcal meningitis can occur with a higher chance of infection in those with implantation with a foreign body (cochlear implant). The best prevention of this infection is with vaccination. Your primary care physician or your child’s pediatrician can arrange for this per instructions from your cochlear implant surgeon’s office. Please see these links for more information. Our office will schedule your or your child’s hospital admission and help you obtain insurance approval and necessary paperwork. Medical clearance from your primary care physician or your child’s pediatrician and pre-operative laboratory studies, including EKG and recent Chest X ray in adults, urine analysis, routine blood chemistries and coagulation (blood clotting/bleeding) studies will be obtained. Other laboratory studies maybe indicated depending on your specific medical history and medications. You or your child will be admitted the day of surgery. You will also meet your anesthesiologist before your surgery that day, if not earlier in pre-operative evaluation at the hospital. The cochlear implant surgery will be under general anesthesia. For very young children, experienced pediatric anesthesiologists are available. The surgery generally takes about two to three hours. Surgical time may vary depending on such variables as middle ear malformation, abnormal placement of facial nerve, or intra-cochlear bone obliteration from prior surgery or infection. Facial nerve monitoring is routinely used in these surgeries to help reduce facial nerve weakness. At the time of surgery, an intra-operative X-ray is usually utilized to confirm successful cochlear electrode array placement. You or your child will be admitted to the Recovery Room after surgery. You or your child will be discharged home that day if medically indicated. temporary pain in operative site following surgery (which can be managed with pain medication). It should be noted that while the above potential complications can occur, they are very infrequent. You or your child will have a post-operative examination our office seven to ten days after surgery. Sutures will be removed at that time. Usually buried absorbable sutures are used for children, so there is no suture removable in children. You or your child will then have an initial mapping session about two to three weeks following cochlear implant surgery. The mapping session is scheduled by the Cochlear Implant Center, where the mapping will take place. The cost for cochlear implantation currently is in the range of $40,000.00 to $45,000.00 depending on the device implanted, length of hospital stay, and other variables. Most insurance companies will cover unilateral cochlear implantation in one year and more insurance companies are beginning to cover bilateral implantation. You will need to check such coverage with you insurance company. Our office will be able to assist you in this process. We hope that this information regarding cochlear implantation and your future evaluations here and at the Cochlear Implant Center is helpful to you. Please be sure to remember to bring your audiometric records and medical history with you or arrange for them to be sent to us prior to your visit. Dr. Hammerschlag’s fax number is (212) 679-9207. Please contact the office at (212) 889-2600 to alert staff before faxing your materials. We look forward to meeting with you and your family to introduce you to the world of cochlear implants, which has dramatically provided communicative access to so many people and their families.